Elizabeth Haynes’ debut novel, Into the Darkest Corner, was published by Myriad in 2011 and became a word-of-mouth bestseller. Myriad also published her next two novels before she moved to Sphere to launch a brand new police procedural series set in the fictional Kent town of Briarstone. Elizabeth returns to Myriad in October to publish her latest psychological thriller, Never Alone. Una’s memoir, Becoming Unbecoming, set in the 1970s during the police search for the Yorkshire Ripper, was a breakthrough in terms of reach, reviews and mainstream publicity for a graphic novel. 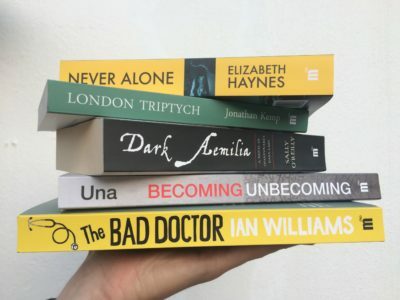 Una was interviewed on BBC Radio 4’s Woman’s Hour, shortlisted for the Emma Humphreys Award and her memoir was listed as ‘Book of the Year’ by a variety of media, from Elle magazine and Emerald Street to Open Book. Jonathan Kemp won the Authors’ Club Best First Novel Award with London Triptych. He followed up with Twentysix and Ghosting, both of which illustrate his commitment to form and linguistic originality. He teaches Creative Writing at the University of London’s Birkbeck College and is working on his fourth novel. Sally O’Reilly, formerly an award-winning journalist with two contemporary novels published by Penguin, submitted Dark Aemilia to Myriad who then relaunched her writing career as a literary/historical novelist, successfully selling US rights to Picador and translation in Italy. Sally is now working on a historical spy thriller based around Aphra Behn and slavery, and is one of the key figures in the movement for New Historical Fiction. Ian Williams, a practising GP and former OCD sufferer, was shortlisted in Myriad’s First Graphic Novel Competition with his extract from The Bad Doctor. Published in 2014, this debut graphic novel was widely praised and reviewed, including in the New York Times and by Alison Bechdel (‘the best thing to happen to medicine since penicillin’). Ian secured a regular column in the Guardian (‘Sick Notes’) and is now working on his follow-up, The Lady Doctor. Ian is also the founder of GraphicMedicine.org and will be helping Myriad to build a niche-within-a-niche list of Graphic Medicine titles.